It’s the end of the year. The day when most people take the time to reflect on their year, on what has happened, on what to give thanks for, taking stock, what should improve, what has been accomplished, what needs to be done. 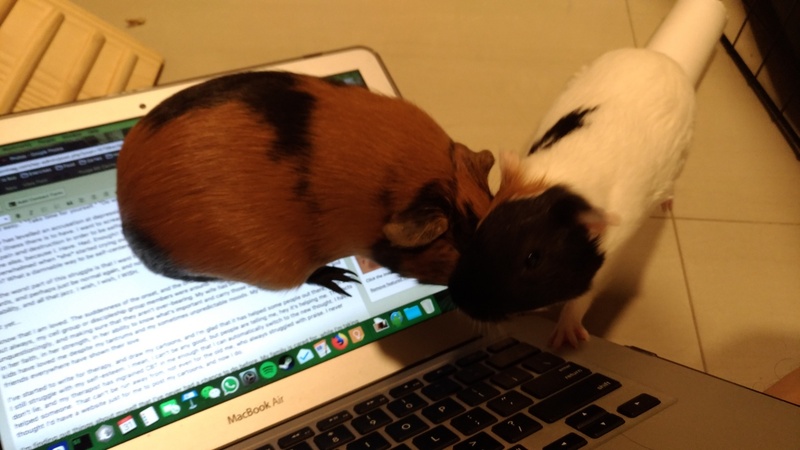 I’m typing this with a headache, with two guinea pigs running around my legs under a towel that I’ve strewn across my lap. My boys are in bed, and the wife is in the shower because she’s only been able to go for her shower after making sure the boys are in bed. I don’t know what to say, really. I mean, I have a lot to say, but nothing is concretely focused, nothing really makes complete and total sense. I started the year well, helping with the moving of the hospice where I was working, to its new premises. Led by a great manager, even though I was nursing a bad cold, we did it. Everything went largely well, with minor hiccups. I found another job after that, and I left well. Two months’ notice, so when I left, I felt everything was in good hands. We went for a holiday, my wife and I, and even managed to spend time with our best friend up north. I started work, and everything went well. The boys were doing okay in school, though I had to give them a stern lecture about responsibility when the common feedback from the teachers was that they were being irresponsible in school. But no matter what, I’d never expected that by mid August, I was trying to end my own life. That I would question the need to live, that I would have made plans to end it all. I’ve never seen the inside of a psychiatric ward before, and I’ve now had that experience. I’ve had depression before, but I can now safely say that what I had back then was nothing compared to what I’ve gone through this round. There are times where it feels so hard to carry on. I never knew that unshed tears could choke, and I’ve had a lifetime’s fill of that, and yet it still happens now and then. I have a loving family that anchors me, or I’d have fallen free of my moorings long ago. I have had so much introspection that I wonder if I’ll ever stop, if this sadness and anger that’s in me will ever let go of me. I’m tired of trying to find a reason to live, so much so that it’s easier to just think of others to be the reason to live. Above all, I’m tired, bone tired, of living with this thing inside me that makes me just feel unwell, and unable to be normal, at least for now. So people usually take this time to assess what’s been going on, and take stock. I haven’t finished taking stock, and there’s still work to be done. Christians aren’t supposed to focus on themselves, and all I keep having to remind myself is, “Take it easy.” “Take time for yourself.” “Do what feels right at that moment.” Or, literally die trying otherwise. Someone has levelled an accusation at depression that I struggle with – that depression is the most selfish, self-centered illness there is to have. I want to scream and yell at the person, how could anyone – ANYONE? – choose this path of pain and destruction in order to be selfish and self-centered? I don’t want this pain! Take it away, give it to someone else, because I. Have. Had. Enough!! Do I want to be selfish? I had to walk away from my wife today because I was overwhelmed when *she* started crying over something she felt she hadn’t done well enough. How the hell is this selfish? What a damnable way to be self-centered! And the worst part of this struggle is that I want to believe that person. Because then I can stop looking at myself, inwards, and perhaps just be normal again, and not be overwhelmed by bone-aching tiredness, mental slowness, irritability, and all that jazz. I wish, I wish, I WISH. I know that I am loved. The suddenness of the onset, and the crisis in this depression was so rapid, so uncontrollable, but always, my cell group or discipleship group members were around. They’ve extended their care and love, unquestioningly, while making sure that they aren’t over-bearing. My wife has been an anchor, despite all the unknowns, in her faith, in her strength, in her ability to know what’s important and carry those out, and leave the rest to God. My kids have loved me despite my tantrums and my sometimes unpredictable moods. My family has rallied behind me, and friends everywhere have shown their love. I’ve started to write for therapy, and draw my cartoons, and I’m glad that it has helped some people out there, much as I still struggle with my self-esteem. I mean, I *think* I can’t be any good, but people are telling me, hey it’s helping me. The facts don’t lie, and my therapist has ingrained CBT in me enough that I can automatically switch to the new thought. I have helped someone. That can’t be run away from, not even for the old me, who always struggled with praise. I never thought I’d have a website just for me to post my cartoons, and now I do. I’m finding out things about myself that I’ve never had a chance to do before. My family is cared for, while I’m taking this time-out, and while I’m definitely struggling, I’m still alive, and able to speak for myself, and be responsible for my actions. That is a gift beyond measure, as I know I am still independent. Broken, maybe. 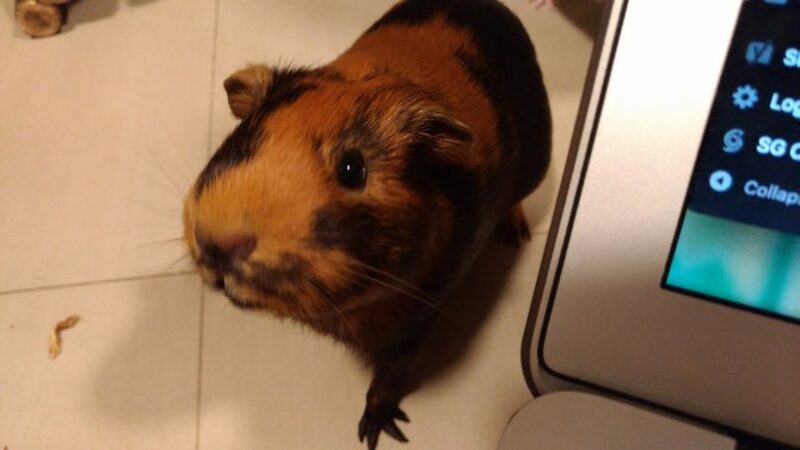 And of course, Heart and Soul, gifts from God in this time of need, with the financial burden taken off us, just so we can have this pair of sweet guinea pigs in our midst, for me to heal. I’ve been asked if I regret having depression. I mean, it’s not something I chose, but I hope you understand it the way the person asking the question meant it. And my honest answer is that I don’t. I’ve understood now, what it means to be on the brink of wanting to kill myself, and yet be given a lifeline amidst the impossible pain. I know better now, how not to judge the pain of others, or their challenges. I know better now, how to accept broken people, and reach out to them, because, hey, I’m broken too, and maybe one day I’ll be healed, but the scars will never really disappear. I’ve had the privilege to hear from others their stories of pain, and also help others along the way. So, no, I don’t regret it. I hate depression itself. But I don’t regret this path that I’ve been given. So, 2017 is at an end. 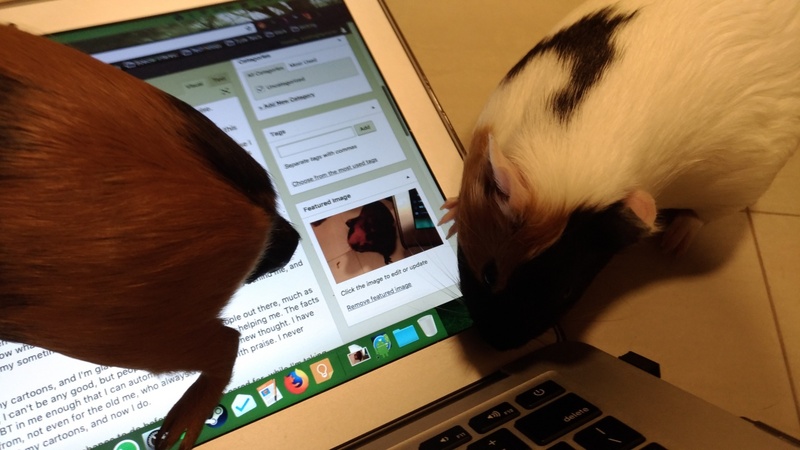 While I sit here and type (and my leg has gone to sleep next to one of the guinea pigs), I wonder what I’ve made of my life. What I’ve become. What I’ve had to endure…? Not so much the last. I wonder when the pain will end, of course, but I don’t think I’ve been through that much, without ever knowing that God was watching, helping and guiding. There were times of darkness, but they were thankfully manageable with His help, His angels, and His people guiding and pushing me along, sometimes more forcefully than others. I don’t know where my life will lead. I don’t know where my career will lead. I don’t know what I’ll do for work. I don’t know what will happen next year. I don’t know when my next paycheck will come. I don’t know where my comics and writing are headed. I don’t know anything, basically, about the future. But I know that God will keep us, through the people around us, through the medicines, through my comics, through the piggies, through thick, and through thin. I won’t say I know why He’s been doing so. But He has. I guess I can live with that for now. Be well, in the new year, everyone. Thank you for journeying along with my family and me. Anyway, you wrote about why you do not regret having depression – and you’ve shared it well. No one has asked me that question before although I sometimes ask myself why the Lord has allowed depression and anxiety attacks in my life… and sadly, I haven’t got an answer… until today. Reading the reasons why you do not regret having depression encourages me – it encourages me because (1) it may very well be an answer to my “why is depression/anxiety in my life” question, and (2), it makes me feel like my difficult and painful journey isn’t wasted. So thank you for sharing…!! Your message has reached me at a time where I’m really struggling through a tough part of therapy, where I feel worthless and useless. I’ll write more about that in a bit, but I’m thankful that God has sent you to encourage me during this dark time…! I’m glad my writing can help someone. Praise God for that.